"By following the steps in Scrum, management learned that sales can lend itself easily to an Agile environment. Individuals found that this shared work model led to more consistent revenue and compensation in addition to a more even workload. No longer did the 'sales stars' work much harder than everyone else. Each team member focused on his/her own domain expertise." This is a lesson learned mentioned in an article by Eric Kristfelt, a sales manager who worked for two Agile organizations. It gives a clear indication that an iterative agile process like Scrum was very helpful for a successful sales team. Agile has strongly affected Sales and selling in two ways. First, sales is a process, sometimes described in 7 stages very similar to the waterfall process. This traditional process has become incompetent in dealing with today's fast market changes and fast learning customers. Scott Gillum discusses this deficient traditional process in his article at Forbes: The Disappearing Sales Process. Gillum relates a study which indicates that "57 percent of the sales process just disappeared", because today's knowledgable buyers already do this part on their own before they contact any provider. Scrum, in this regard, has improved the sales process so much. Team started talking about adopting Scrum in sales, and doing marketing and sales sprints to improve learning about opportunities and customer needs, and improve fast response to customers. In this study, such fast response (when done within 5 minutes) makes the chance for a successful connection 100 times better, and the chance for successful qualification 21 times better! Second, sales traditionally focuses on the individual sales person. Now, thanks to the agile mindset, sales people are talking about cross-functional sales teams! Refer to Eric Kristfell article above for an example how sales cross-functional teams has created a better collaborative and successful environment, and resulted in the best target achieved in the organization. Also, this presentation is very useful example of how agile team roles maps to agile sales team roles. "Company revenue increased by 100% after Scrum implementation in the first quarter. Although market changes also contributed to this result, the general manager indicates that at least 50% of the revenue increase can be contributed to the adoption of Scrum"
In short, any discipline which leans towards knowledge work will benefit one way or another from the agile values and principles. This is the first post in a series. 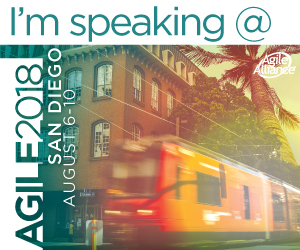 In this episode, I will talk very briefly about Agile Education. The first reference is Steve Peha's Article at Infoq: Agile Schools: How Technology Saves Education (Just Not the Way We Thought it Would). What interesting in this article is the the very similar Manifesto for Agile Education which Steve came out with, with minimal changes from it original agile manifesto. Steve has not only mapped the 4 values and the 12 principles, he had also put helpful discussion of team practices which also applies to education! Another attempt to mapping is done in this workshop by Hala Salah with some school teachers. After introducing them to the Agile Manifesto, Hala has facilitated an exercise with the teachers to come out with a similar value statements for Education. The audience have very smoothly came out with several versions of value statements which reveals the very close correlation between the Agile Manifesto and the field of Education and Study. 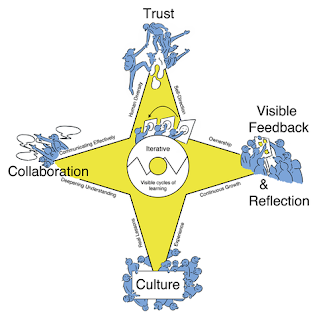 This compass "was created by a group of passionate Agile Educators who met face-to-face at the Scrum Gathering in Orlando, Florida between April 16-20, 2016". What's interesting about his compass is that it describes transformation as a journey from traditional eduction notions which has been in the mindset of educators since long like 'content', 'competition', and 'evaluation' to more appealing and agile notions. The next episode will be about Agile and Sales. Keep Alert!